Mega Evolutions, a mechanic first introduced in Pokemon X and Y for the Nintendo 3DS, has been confirmed to be in the upcoming Pokemon Let's Go Eevee! and Let's Go Pikachu! for the Nintendo Switch. The reveal was published in the latest issue of CoroCoro, a monthly Japanese manga magazine that has had exclusive drops on new Pokémon games for many years. Mega Charizard, Venasaur, and Blastoise were the first Mega Evolution Pokémon to be showcased in the publication. The news follows earlier leaks from various publications stating that new Mega Evolution Pokémon could appear in the series, with Raichu and Starmine being the most cited. Mega Evolution isn't the only mechanic coming to the brand new Let's Go series. Last weekend, The OP learned first-hand that those elusive Shiny Pokémon could be captured in the overworld after playing the game at a NintendoUKVS event in London. We were also told how capturing Pokémon would work when playing the game in handheld mode. The player must physically turn their Nintendo Switch around to find the Pokémon in a 360 degree space, needing only to press a button to throw a Pokéball. With Mega Evolution joining the Let's Go series, it will be interesting to see just how the game expands the feature. 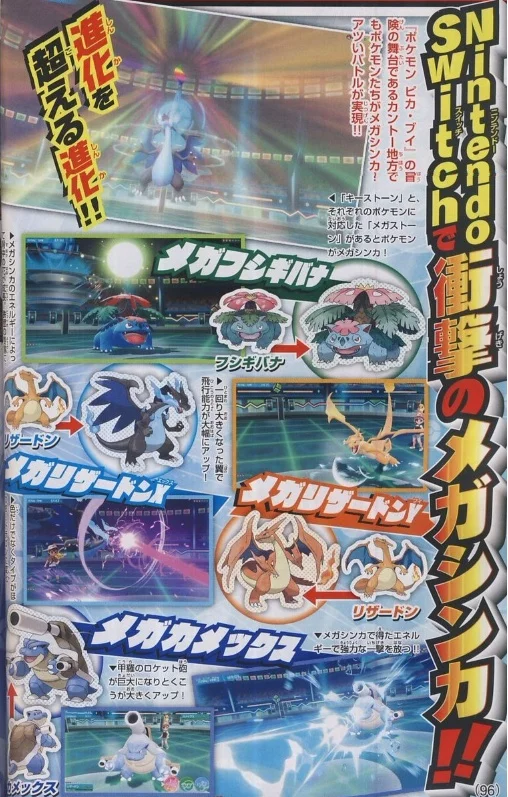 According to CoroCoro, the games will require you to equip the Pokémon with its associated Mega Stone to perform a Mega Evolution, but how players will find these stones in Kanto has yet to be revealed.